It's almost here! The Northern State River Run 10th Anniversary Party on the River is Wednesday, September 11, through Saturday, September 14. These are the 13 shops participating: Thistle Dew Quilt Shoppe, Runs with Scissors (Citrus Heights), Whistle Stop Quilt Shop (Auburn), Sugar Pine Quilt Shop (Grass Valley), Angel Quilters (Lincoln), Sew So Shop (Yuba City), Quilt Corral (Willows), The Rabbit Hole (Chico), Debbie's Quilt Shop (Paradise), Morning Star Quilts (Paradise), Blue Iris Quilt Shop (Palo Cedro), Sew Simple (Redding), and Sew What! (Redding). Every shop will have a fun party theme and will be open from 9:00am to 7:00pm each day. There are lots of fabulous prizes, including a grand prize of a Bernina 350 sewing machine and thirteen first prizes of a $100 gift certificate from one of the participating shops! And....there will be a 15% discount on regularly priced fabric, notions, books, and patterns at each store! So mark your calendar, get a group of your quilting friends together, and start making plans! 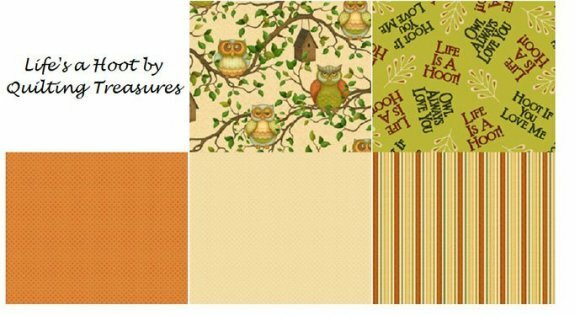 We have another adorable collection featuring owls from Quilting Treasures, Life's a Hoot. "Owls are the trendiest birds around - flying high in the worlds of fashion, home décor, the gift trade and quilting! 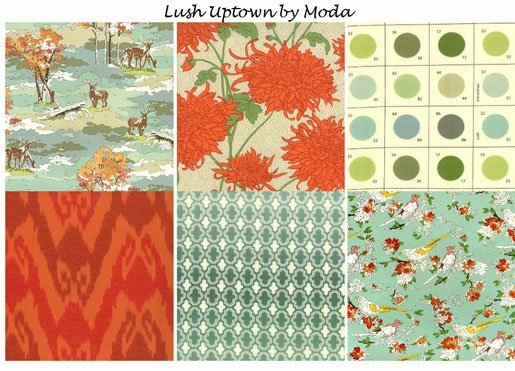 The fresh artwork and serene color palette of this collection make it ideal to use for kitchen, family room and home dec accessories." 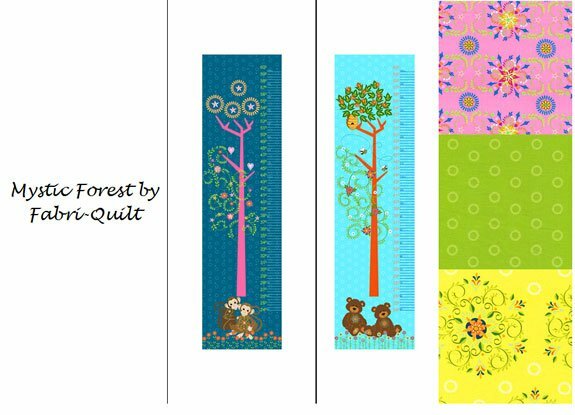 And here's another nature-themed collection, also from Quilting Treasures: Melody. This collection "has an illustrated, painterly style. Very home friendly with its color palette of soft blue, sage, khaki and grey. These fabrics will look lovely used to create many projects for bedroom décor, ... or a table runner to use in the dining room!" 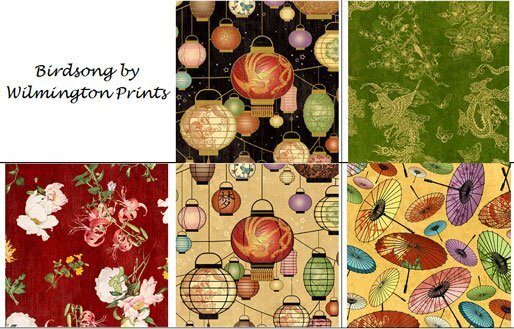 And we have bolts and bolts of wonderful holiday prints - scary and fun for Halloween, beautiful and gracious for Thanksgiving, and traditional and whimsical for Christmas. 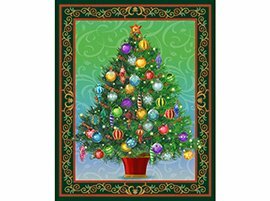 We have lots of the Christmas tree panel from Quilting Treasures that has been so popular (pictured below). 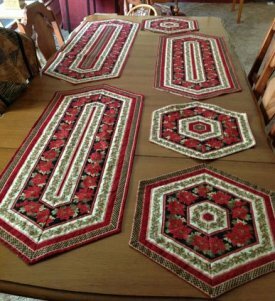 Many of these collections feature border stripes that are great for making beautiful, simple table runners -- Also pictured below are table runners made by one of our customers, Mary Hammarin, using one of our Christmas border stripes. Sit & Sew, Thu, Aug 8, 1:00 - 5:00 p.m.
Women of Courage BOM, Sat, Aug 10, 9:00 -10:00 a.m.
Imperial Blooms BOM, Sat, Aug 10, 10:00 a.m. - 1:00 p.m.
Women of Courage BOM, Tue, Aug 13, 9:00 -10:00 a.m.
Imperial Blooms BOM, Tue, Aug 13, 10:00 a.m. - 1:00 p.m.
Provence & Beyond BOM, Thu, Aug 15, 6:00 - 7:00 p.m.
Blankets for Preemies, Fri, Aug 16, 11:00 a.m. - 3:00 p.m.
Gardener's Alphabet BOM, Mon, Aug 19, 9:00 a.m. - noon. -OR- Tue, Aug 27, 1:00 - 4:00 p.m.
Hand Piecing, Tue, Aug 27, 9:00 - 11:00 a.m.
American Girl Doll Sit & Sew, Wed, Aug 28, 1:00 - 4:00 p.m.
Crazy Quilt Group, Mon, Sep 9, 10:30 a.m. - 1:30 p.m.
Sue Spargo's Felted Wool Pin Keeper, Judy Cummings, Thu, September 26, October 3, and October 10, 10:00 a.m. - 1:00 p.m., $25, supply list. 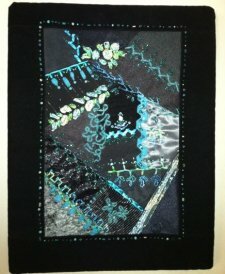 In these three sessions, you'll learn how to applique wool pieces to a wool background and then Judy will teach several beautiful, simple embellishment techniques. And, you'll have a very pretty pin keeper! A kit must be purchased for this class. The kit costs $24.99 and includes all the felted wool, thread, stuffing, and embellishments needed for the pin keeper. 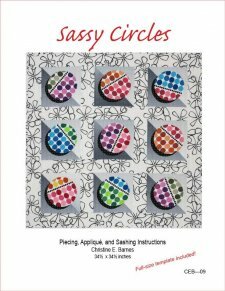 Sassy Circles Wall Hanging (32-1/2" x 32-1/2"), Christine Barnes, Sat, September 28 and October 26, 10:00 a.m. - 4:00 p.m., $75, supply list. Dotted circles and gray ombré triangle squares seem to float on a backdrop of black-and-white sashing in this graphic quilt. You'll create the blocks in the first class. (The circles and shadows are a snap to make, using freezer paper and machine appliqué.) In the second class, Christine will demo her method for stitching accurate, square sashing. Warning: circle quilts are addictive! 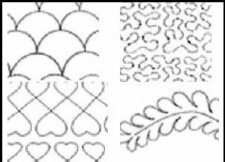 Beginning Machine Quilting, Dana Lahargoue, Thu, September 26 and October 3, 5:30 - 8:30 p.m., $40, supply list. In the first session, you'll learn machine set up and basic shapes and backgrounds and will have lots of time in class to practice. In the second session, you'll take your new found skills and put them to work on a continuous line design which you can use as a small wall hanging or pillow. This class is the perfect opportunity to learn from a wonderful instructor. Dana is an award winning machine quilter with many years of machine quilting and teaching experience. 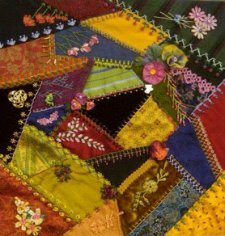 Beginning Crazy Quilting, Toni Jordan, Sun - Oct 6, 11:00 a.m. - 3:00 p.m.; Oct 13, 11:00 a.m. -13:00 p.m.; Oct 20, 11:00 a.m. - 1:00 p.m., $60, supply list. In the first session you’ll construct a 14” block using a wide variety of fabrics; cottons, silks, tapestries, velvets, linens… In the second session you will start the embellishments. You will learn a variety of embroidery stitches using different threads and techniques. In the third session, you will learn more embroidery stitches and embellishment techniques using buttons, laces, jewelry and other “finds”.